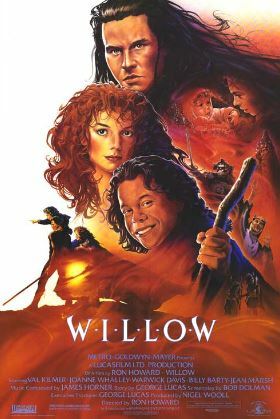 Rewatching the 1988 movie Willow one scene at a time. Why? Because it’s freakin’ Willow! The battle of Tir Asleen kicks off with a lot of info, including some serious troll action, 1:27:19-1:29:03. We’re in “preparing for the battle” mode, but this is all shot and edited as if the fighting has already started, with a lot of pulse-pounding music and quick-chop cuts. Outside the castle’s main gate, Kael says, “Assault! Sorsha, battering ram!” Not sure why she’s the one who should get battering ram duty, except to let the audience know she’s on the scene. Madmartigan rolls a large barrel over a bridge over a pool of mossy green water. Willow prepares a catapult, lowering it and hooking into place with a big metal chain, all while holding the baby. Madmartigan drags a bunch of suits of armor behind him. Outside, one Nockmaar with an axe hacks away at the tree. It appears as if he’s just started. Madmartigan prepares another catapult. I’m not clear on why there are catapults on ground level inside the main gate, but these are smaller ones, only a little taller than Madmartigan, so perhaps this is what they were designed for, in case enemies get through the gate. Here’s our first hint that time has passed. The Nockmaar fall the tree, having successfully cut through most of the truck by now. Madmartigan sets up a bear trap in the mud. Is this typical soldier behavior in this world, or did Madmartigan also find a stash of hunting supplies? Willow runs across a bridge in the upper part of the castle, and we finally get our first glimpse of a troll, climbing on the wall and then the bridge underneath Willow. A second troll climbs down a wall on the top left of the screen. This was done with animation, with animated trolls being mere silhouettes, standing out against the background. The animated troll becomes practical in the next shot, keeping pace with Willow as he runs across the bridge. Willow bangs his shoulders against a door, and there’s our first close-up of a troll, ape-like with a blueish-black face with some pink flecks in the skin. It seems really angry, shaking its head back and forth in rage. The tie-in fiction offers little additional information about trolls other than what we see in the movie, describing them as animalistic and more of a nuisance than a full-on monster. There is one curious detail, though. About one out every hundred trolls, the books say, are born with human level intelligence. For some reason, these are called “Troll Sports.” Further, the books say that Bavmorda was fond of the Troll Sports rounding them up and putting them to work (against their will, one assumes) in her castle. Madmartigan sets up some crossbows on a barrel, possibly the same one from seconds earlier. Outside, the battering ram makes some damage against the door. Willow places the baby down on a small stone structure outside the door he couldn’t open. Then the trolls jumps down (from where?) and spooks Willow. On the ground below, Fin Raziel has apparently been watching this, and says “Willow, use the wand on that troll.” The troll moves to attack. The wand starts to glow blue before Willow even does anything. Then he aims it at the trolls and says a magic work, “Bellanockt!” This throws the troll backward, with yellow smoke flowing from under its fur. Then things get really gross. The troll’s body curls up into a ball, only two tentacle-like arms to come of it, rips of its own skin, revealing a gooey brain-like shape underneath. Willow looks at the wand and then back at the slimy thing. In a nice bit of foreshadowing, two little heads pop up out of the blob, looking a little bit like the chestburster from Alien. Willow looks appropriately grossed out, and kicks the thing off the bridge, it falls and lands in what looks like the mossy green water from earlier. (Is this supposed to be a moat? Why is the moat inside the courtyard? I’m rather confused as to the geography of this place.) The water starts bubbling, so the audience knows something is up. Outside, we see the battering ram making more progress on the gate, with Kael shouting, “Break it down! Forward!” The gate opens, while Madmartigan continues to ready the crossbows. We see Nockmaar soldiers on the other side, raising swords into the air, and others arms with flaming arrows, ready to fire. And now it’s time for the battle to begin.